We sell eight varieties of premium sweet cherries. 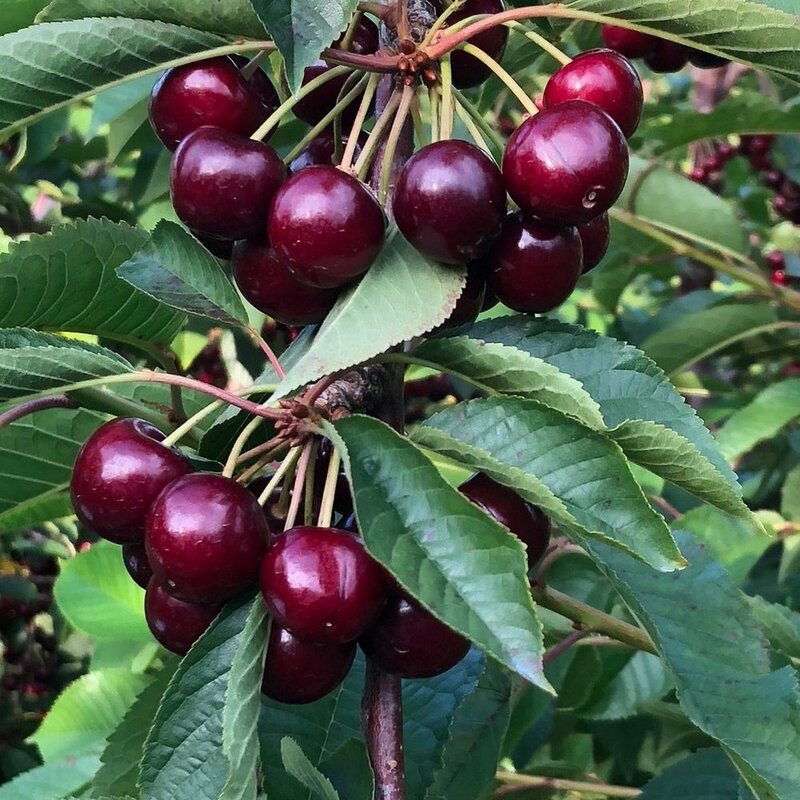 The entire orchard has been planted since 2010 and is composed of modern varieties, resulting in a larger, more flavorful cherry from a tree that is more accessible and easier to pick. A unique service of HH Cherries is our pre-ordering system that will be starting in the upcoming seasons, delivering fresh, ripe sweet cherries right to your front door! Stay tuned for updates as we will be collecting contact information of those interested. If you would like to sign up for the list ahead of time, please send us an email titled "Contact information for pre-order" through our Contact Us page. Cavalier cherries are an early, medium-sized cherry, which is commonly planted across Michigan. A dark burgundy color coupled with a robust cherry flavor. They are an early delight to kickoff the season. Summit is moderately firm, and very sweet and aromatic. The pits are small, which means more sweet cherry flesh for you to enjoy. ‘Summit’ was introduced in 1973 and is best eaten fresh as it can be a challenge to ship. Generally ready to start harvesting the second week in July. The Ulster cherry is a mid-season cultivar, and a long time favorite of local growers. It is a large cherry with moderately firm flesh and a juicy center. Ulsters sometimes measure more than an inch in diameter. Attikas are a dark, full-sized cherry that ripen mid to late season. The skin shimmers in the sun and the long stem serves as a wonderful handle for savoring. They are firm, almost crunchy, with a full flavor that begins with a sweet burst followed by a lingering tart twist on the back of one’s tongue. Vulnerable to frost during the bloom, they are planted on high ground to avoid the frost in the valley, which kills the delicate bloom flowers. Generally ready to harvest in mid-July. White Gold are a mid-sized, yellow colored cherries with red and pink specks and a super sweet taste. These ripen early to mid season. Generally ready to harvest the second week of July. 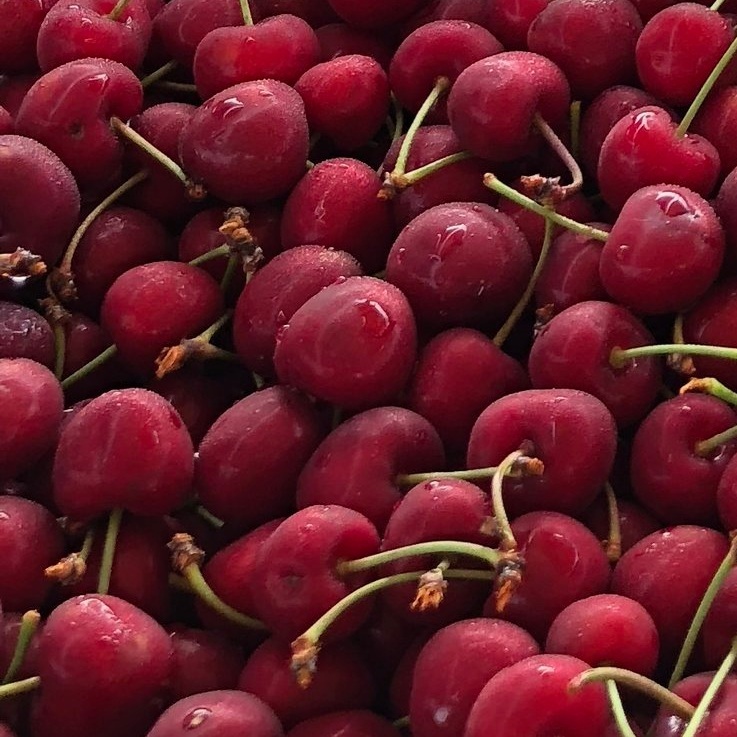 Reginas are a very large, dark red, firm, late-season sweet cherry with a more subtle cherry flavor profile. Its sweet low-acid flavor, crunchy texture and eye appeal commands attention alongside its extra long stem. This variety is harvested about the third week in July and is reported to store for up to five weeks. As the name suggests, Sweetheart is a large, bright red heart-shaped cherry. Sweetheart matures at the end of the season, just before August, and remains firm after picking.